A promise made by Donald Trump during the campaign was to remove gun free school zones. The federal gun free school zone law has been an abominable infringement on the Second Amendment. It has no justification as anything other than an infringement on the right of Americans to bear arms. It does not improve safety. It does not protect “sensitive places”. It serves no legitimate purpose. It has already been struck down once by the Supreme Court. The Gun Free School Zone act creates an illusory “zone” where most people are forbidden from bearing arms. The zone exists within 1,000 feet from the property line of any school. It is unmarked and mostly unenforced. It was struck down by the Supreme Court in 1995 in the famous U.S. v Lopez decision, where the Court concluded that there was no interstate commerce involved in a person bearing a firearm within a thousand feet of a school. That was the correct decision. President Clinton immediately pushed through a replacement bill, the Gun Free School Zone Act of 1995, with a few minor changes. The change that was supposed to make the law acceptable to the Constitution was that it only applied to guns that had been “involved” in interstate commerce. That is distinction without a difference. Everything is “involved” in interstate commerce. The molecules of oxygen that you breath have crossed state lines. The ore that was used to create the steel used to make a gun barrel crossed state and international borders. If that is not enough, the water used to cool the turbines that created the electricity to power the motor that turned the machine to shape the gun barrel, crossed state lines. This is the insane thinking that has made the phrase “interstate commerce” a nullity. The original law was struck down because everything is *not* interstate commerce, and the legislature cannot make it so simply by so stating. The Gun Free School Zone law is a direct affront to the Second Amendment. In U.S. v Lopez, the Second Amendment was not argued. The Heller and McDonald decisions had not yet been decided. But to ban the bearing of arms from public places anywhere within a thousand feed of a school is clearly an infringement of the first order. 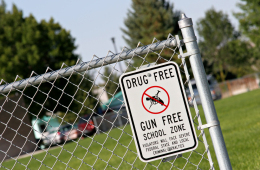 The 20 years of existence of the current Gun Free School Zone Act have resulted in a tiny number of cases, virtually all of which involve concurrent other crimes. The act has no purpose other than to create precedent that the federal government has the power to disarm anyone, anywhere it desires. It might need to put the word “school” in such a power grab, to grant a fig leaf of deflection for justification. Many believe the lack of enforcement is from a desire not to have a case tested in court. A Trump administration can attack the law from two directions. One is the obvious, frontal approach. Have the Congress repeal the law. It is plausible, and it could work. Members of Congress take an oath to uphold the Constitution. The second is to create a test case to bring the law in front of a constitutionalist Supreme Court, to be struck down on both Commerce Clause and Second Amendment grounds. A sympathetic case could be made where a U.S. Attorney prosecutes an otherwise blameless black woman for possessing a legal firearm within a thousand feet of a crime ridden school in an inner city, or perhaps a Native American within a thousand feet of a small school in Wyoming. Creating a test case is the method that was used by the Franklin Roosevelt administration in U.S v. Miller. The prime actor in U.S. v Miller was Judge Heartsill Ragon, a Roosevelt ally, the Chuck Schumer of his day. Heartsill Ragon was the representative from Arkansas who was supported by the KKK for his election in 1922. He introduced and managed to get passed, the ban on selling pistols through the post office, the first federal regulation of gun sales. Judge Ragon was appointed by Franklin Roosevelt. Ragon created the Miller case, selected the defense attorney, the defendants, and requireing the case to be appealed to the Supreme Court. It was a complete set-up, created and orchestrated by a Roosevelt appointee. A school zone case could be found or created and guided through the courts. Today, the process is longer, but it could be done. Perhaps both avenues should be pursued. They would reinforce each other. The judicial branch could be used as reason to push forward with the legislative solution. Uncertainty in the legislative solution would give impetus to the judicial one.